That mini catalog we've loved since September! 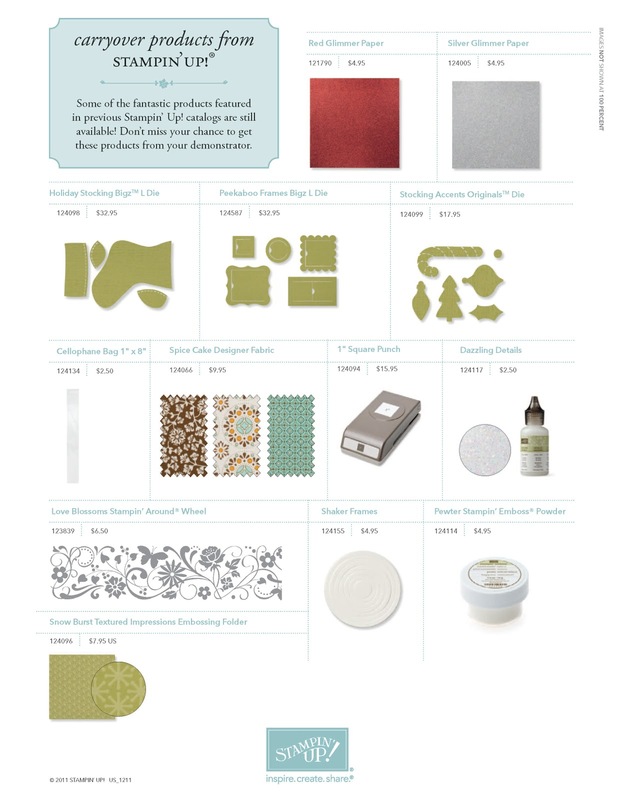 The last day to order from the Holiday Mini Catalog 2011 will be tomorrow January 3rd, 2012!!! There are a few awesome items that will carry over into the next mini catalog (the simply fabulous Simply Scored Scoring Tool #122334 and accessories - see page 7) but for the most part, you need to get your order in STAT to get these items! If you'd like to download a copy of the Holiday Mini, please click on the image in my left sidebar. You can also see all the items in my online store, click on the Shop Now link at the bottom of this post and then click on the Holiday Mini link in the left column there. 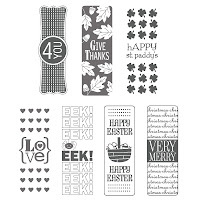 ﻿A set of 7 adorable stamps to decorate your mini-chocolate candies, or to add borders to scrapbook pages or cards. 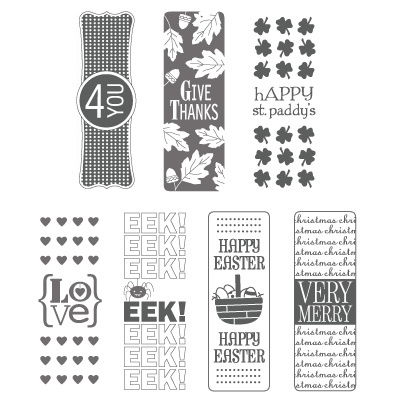 Versatile, includes any-time "4 You" or "Love" - great for weddings, shower favors, or teachers gifts; as well as St Patricks Day, Easter, Thanksgiving, Halloween, and Christmas. There are a dozen tutorials for cute candy gift boxes, baskets, and bags - these would add a great finishing touch to your project. The Shaker Frames (124155 pg 38 - CARRYOVER!) will still be around, but the mica flakes may not be. These are delicate and shimmery, perfect for the ideal snow globe effect, and really a very optimal alternative to glitter ((you know how I am about glitter!! :-/ )) I suggest a little tub or two of these to keep on hand. ﻿﻿Tuck these pretties away and be ready to decorate next year. Easy to use vinyl pieces, and I think these are really beautiful designs. 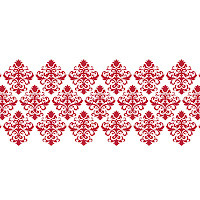 I would also like to point out the red of the Damask print would be amazing for Valentines Day, if you wanted to have a transitional piece to stage your decorating on. It would be beautiful on an old window, handing behind your entry table, or added to canvas - very mobile. 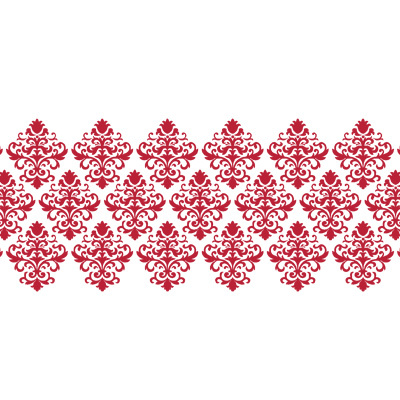 It could be the backdrop for your Christmas, New Years, and Valentines displays. This was a great gift idea for the holidays, for sure, but you know it would make your life easier through the New Year too! 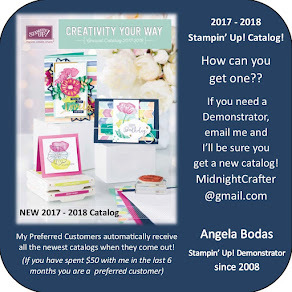 Perfect to get organized for the new year, or an amazing gift to make and keep on hand for birthdays, thank you gifts, or teachers gifts. Very customizable, you can dress it up or down according to your need. Also good to store cards wrapped with ribbon, or color samples, or scraps of paper. ﻿Perfect time to grab a couple of these to save all those memories of the past holiday! 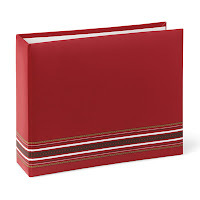 You could also get a book ready for next year, and be ahead of the game on your scrapbook - or use it as a guest book for all those parties? Lots of options... Also to note, the Album would make a delightful Valentines offering, or to save those sweet memories of how you've celebrated over the years. 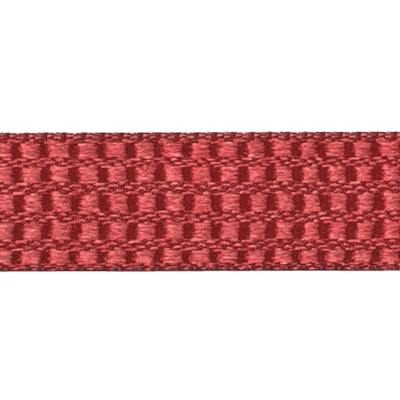 Its a great color that works well for masculine gifts, but you could also dress it up to be a bit frilly and girly. Dashing all the way! How adorable and precious are these little jingles?!? 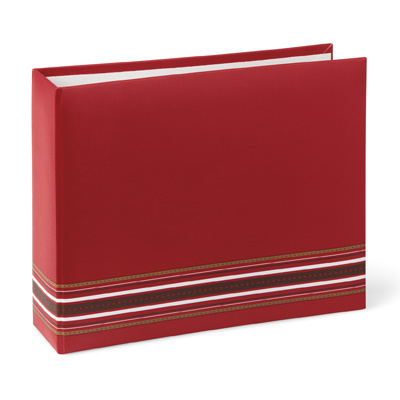 A really special embellishment to any page or card, the bells really ring. 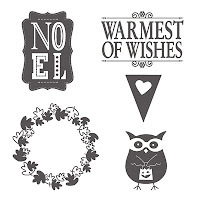 Use them on paper crafts, or add them to your sewing projects or home decor crafts. Just unique, and so very tiny! 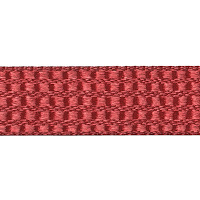 ﻿ I love to get ribbon from the mini catalogs because it is so unique, this ribbon is just deluxe! Great colors for those masculine cards, and a really elegant finish make it definitely one of my favorites. Edited to add: The Early Espresso is gone already, grab some of the Cherry Cobbler - you won't be disappointed! 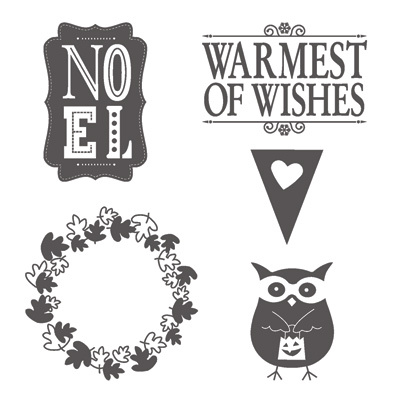 A set of four sentiments, with beautiful flourishes that will add elegance to any project. 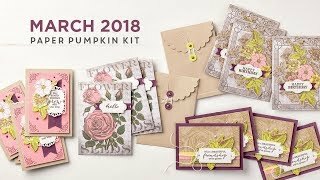 Great versatile set, it does include "With Love" and "Give Thanks" that you can use all year long for birthdays, anniversaries, thank you cards, and notes. A really stylized "Happy Halloween", and a sweet "Merry Christmas" round out the set and will work well on cards or scrapbook pages or gifts during the holiday seasons. I hope you'll get the chance to get this adorable set, I love when the stamps coordinate with punches and this one is a set of 5, where 4 of the 5 stamps coordinate with a punch! Wheee!! The pennant is a perfect addition to the pennant collection, and the wreath is just adorable, and how on earth can you pass up the sweet little trick-or-treat owl!?! Great Hostess set, as usual, but it will be gone soon!